I'm organic. Finger food. From 10 months. Firm + crumbly. No concentrates. Just yummy organic snacks for babies. I contain naturally occurring sugars. No added refined sugar or salt. 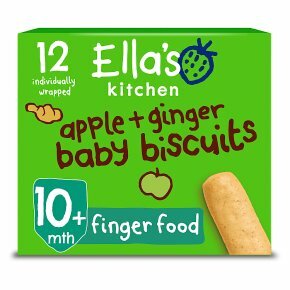 No additives or colourings.Hello, I'm 12 individually wrapped Organic Apple + Ginger Baby Biscuits. I'm a fun + tasty finger food made for playing and learning, but with less mess. Who am I made for? I'm made for babies from 10 months. I'm just the right size + shape to help little ones get to grips with holding food and feeding themselves. My texture is firm enough for little gums to chew, yet soft enough to melt in little mouths. Using me: Because at this stage babies can hold objects and love to bang things on the table, like it's a drum! The texture of these biscuits means they make great edible drumsticks! Warning: I'm not suitable for babies under 10 months old. When a baby over 10 months is munching me, make sure they're sitting down and are supervised by a grown-up to reduce the risk of choking.